Every Easy Racer that we sell has a racing heritage. Even before company founder Gardner Martin began selling recumbent bicycles in 1979, he was building and racing them. In 1975 Gardner designed his first race bike. 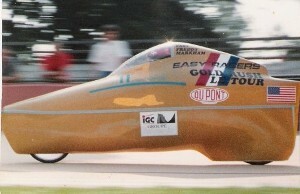 Since then the Easy Racers Team has competed at such storied venues as the Indianapolis Motor Speedway, the Bonneville Salt Flats, and at the opening ceremonies of the 1991 Tour De France. Along the way they have won numerous events on road courses, at the velodrome, and have set 21 world records. In 1979, legendary cyclist Fast Freddy Markham became the first person to exceed 50 mph on a bicycle while aboard an Easy Racer. He would go on to become the first to achieve 60 mph, and in 1986 won the heralded DuPont Prize after exceeding 65 mph. The Gold Rush that he rode to set that record is now property of the Smithsonian Institute for display in various museum exhibits. 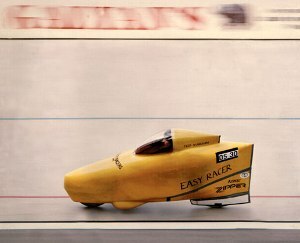 From 1983 to 1993 the Easy Racers Team dominated nearly every form of human powered vehicle (HPV) racing, setting 13 world records and winning almost every event that they entered. Easy Racers still competes to this day and its bikes and riders can regularly be found at various HPV events all over the country and annually at the events held in Battle Mountain, Nevada. One of the original race bikes that Gardner designed was the "Belly Bike." 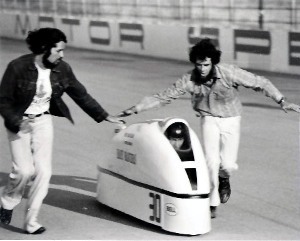 On May 6th, 1979 at the Ontario (California) Motor Speedway it became the first human powered vehicle to exceed 50 miles per hour. Here you can see Alan Osterbauer (left) and Gardner steadying Fast Freddy at the start (top), and the bike at full steam (50.84 mph) (bottom). 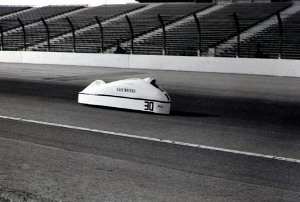 At the 1984 International Human Powered Vehicle Association (IHPVA) Championships in Indianapolis, IN, the Easy Racers Team dominated the field in the road race (top), finishing almost two minutes ahead of second place. On The Major Taylor Velodrome at that same event, Fast Freddy bested his own world record in the 4000 meter pursuit (3 minutes, 43 seconds) (bottom). 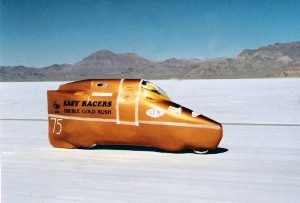 A 1989 episode of the ESPN program "Great American Events" featured John Howard, Fast Freddy, and the Easy Racers Team at the Bonneville Salt Flats. Two tandem world records were set that day aboard the "Double Gold Rush," one for the fastest mile (58.81 mph average) and one for the fastest kilometer (60.49 mph average). 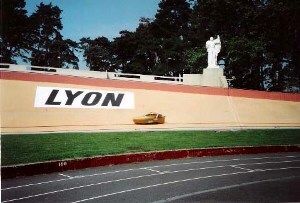 In 1991, the Easy Racers Team was invited to make a record attempt at the Parc de la Tête d'Or velodrome in Lyon, France, just prior to the start of Le Tour de France. Desite blowing out a tire in practice (top) and suffering a brutal crash, Fast Freddy managed to set a new kilometer world record with a 53.43 mph average speed in the Gold Rush "Le Tour" (bottom). Chris Springer and Fast Freddy went on a tear at Battle Mountain in 1991. On October 1st they hit a top speed on 66.87 mph in the "Double Gold Rush," a tandem world record which they smashed 4 days later when they went 68.91 mph. The duo also set tandem world records in the flying mile (68.36 mph average) and the flying kilometer (68.51 mph average). 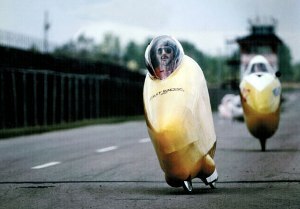 The 2002 World Human Powered Speed Challenge brought Easy Racers 3 new world records. 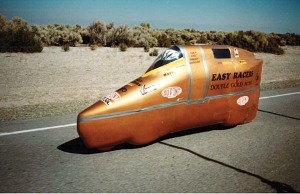 Tanya Markham and Mackie Martin set a junior tandem world record in the "Double Gold Rush" when they went 53.48 mph. Mackie achieved a top speed of 60.75 mph in the "Virtual Rush" (left), a junior record. Tanya hit 52.30 mph in the Gold Rush "Le Tour" (right), a woman's record. Tanya continues to race for Easy Racers today and hopes to sameday become the fastest woman alive!